Xmas party - Christmas with the The Hipcats - Rat Pack and Swinging for your event in Bristol, Bath, Wiltshire, Somerset, Gloucestershire and across the UK. Get 'the coolest, smoothest, classiest, swinging, groovy cats in town' this Xmas! The perfect jazz and swing band for your Christmas Party. Have a Swinging Rat Pack Xmas! 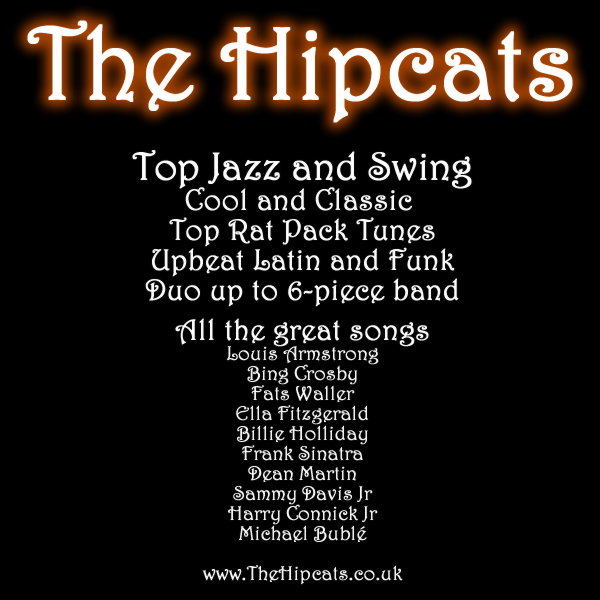 The Hipcats live jazz band for Christmas parties, corporate functions and other event at Xmas. Great band for hire for your Christmas event , perfect party band, brilliant function band and just the right thing if you are looking for a jazz singer or jazz band for a Rat Pack Xmas with the sounds of Frank Sinatra, Dean Martin, Michael Buble or any of the great swing singers. The UK's finest jazz and swing band.